yep, so sub $100.. be glad with what you get out of it.. you pay for what you get..
apart from the port forwarding thing its fine for me. yeah i havent been inclined to host my minecraft server lately, i've been occupying myself with other games instead. 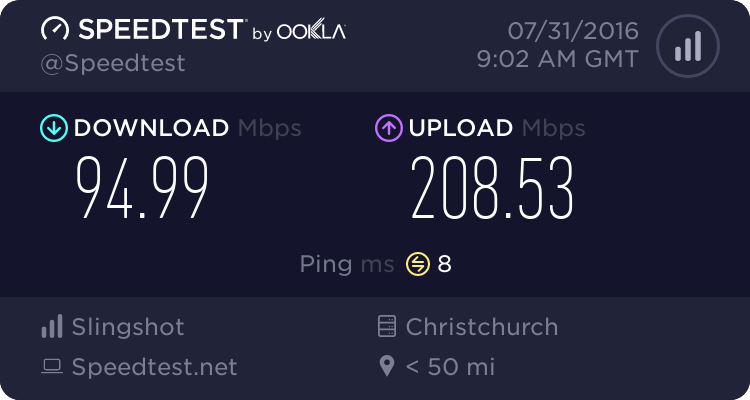 it worked fine on adsl, so i imagine VDSL will be 10 times better. i tried hosting it on windows azure for a while, but the latency to the US was awful and i moved it back to my computer instead. adsl is painful with a single player alone.. i must just notice it a heap more.. I have disable the logs and the anti-attack settings to see if that was causing the issue. Hard reset as well. Now awaiting a replacement from Slingshot. They kept blaming it on the VDSL "tweaking". Really? is that why I can't ping the default gateway? OH is not at all happy with my hard sell to her of better faster stable internet! I also cannot set the IP forwarding as I get the same ACL issue. as previously described. reboots that often many days in isnt likely to be DLM.. and would be very detrimental to a VDSL line profile.. I got this modem on Friday. I have only been able to access .co.nz websites, with the odd .com. Slingshot say its a firmware issue, and they will send me a new modem. No premierleaguepass.com for me today, as that's one if the dead ones.......that's a whole different complaint! Wouldn't it be better for everyone involved, if they just sent out a modem that worked to being with. What about all the non-technical people out there that end up with this junker! gunnerpc: I got this modem on Friday. I have only been able to access .co.nz websites, with the odd .com. That does not sound like a firmware or modem issue, what are your computer DNS settings? I didn't think so either. But I went through changing all of the DNS settings with the Slingshot "tech" on the phone. I also changed them all myself too. Right now they are the factory settings.